Liver abscess is also known as pyogenic hepatic abscess or amebic hepatic abscess. 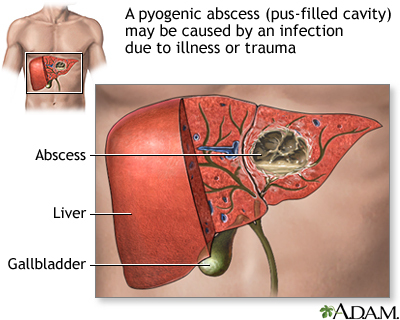 Liver abscess is a necrotic infection of the liver usually classified as pyogenic or amebic. spp. [24%], Fusobacterium spp., Actinomyces spp., gram-positive anaerobes,and Staphylococcus aureus). -Diverticulitis or appendicitis with spread via the portal circulation. -Infection by way of portal system (portal pyemia). isolated, a distant source of hematogenous seeding should be sought. -Biliary disease with cholangitis (accounts for approximately 40% to 60%). -Gallbladder disease with contiguous spread to the liver. into the portal system to reach the liver. The differential diagnosis of liver abscess are diverticulitis, cholecystitis,cholangitis, pancreatitis, appendicitis, perforated viscus, mesenteric ischemia and pulmonary embolism. rather than multiple abscesses, subacute onset of symptoms, and absence of conditions predisposing to pyogenic liver abscess. transaminase (ALT) elevated in 50% of cases; elevated bilirubin (28% to 30%) and decreased albumin. (positive in 10% to 15% of amebic liver abscess cases) and serologic testing for E. histolytica does not differentiate acute from old infections. Ultrasound (80% to 100% sensitivity in detecting abscesses) shows round or oval hypoechogenic mass. CT scan is more sensitive in detecting hepatic abscesses and contiguous organ extension and is the imaging study of choice. Chest x-ray: abnormal in 50% of the cases, may reveal elevated right hemidiaphragm, subdiaphragmatic air-fluid levels, pleural effusions and consolidating infiltrates. Most liver abscesses are single; however, multiple liver abscesses can occur with systemic bacteremia. antibiotics is the rule in pyogenic liver abscess. Percutaneous drainage under CT or ultrasound guidance is essential in the treatment of pyogenic liver abscesses. Aspiration of hepatic amebic abscesses is not required unless there is no response to treatment or a pyogenic cause is being considered. Empiric broad-spectrum antibiotics are recommended initially until culture results are available. If fever persists for 2 wk despite percutaneous drainage and antibiotic therapy as outlined or if there is failure of aspiration or failure of percutaneous drainage, surgery is indicated. In patients not responding to intravenous antibiotics and percutaneous drainage, hepatic artery antibiotic infusion can be considered. In patients with evidence of metastatic disease that is causing biliary obstruction, a gastroenterology consultation for endoscopic retrograde cholangiopancreatography and stenting should be considered. Follow-up imaging should be used to monitor response to therapy; continue treatment until CT scan shows complete or near complete resolution of cavity.